This is an original hand-painted limited edition featuring Michigan J Frog from the Warner Bros. Studios. 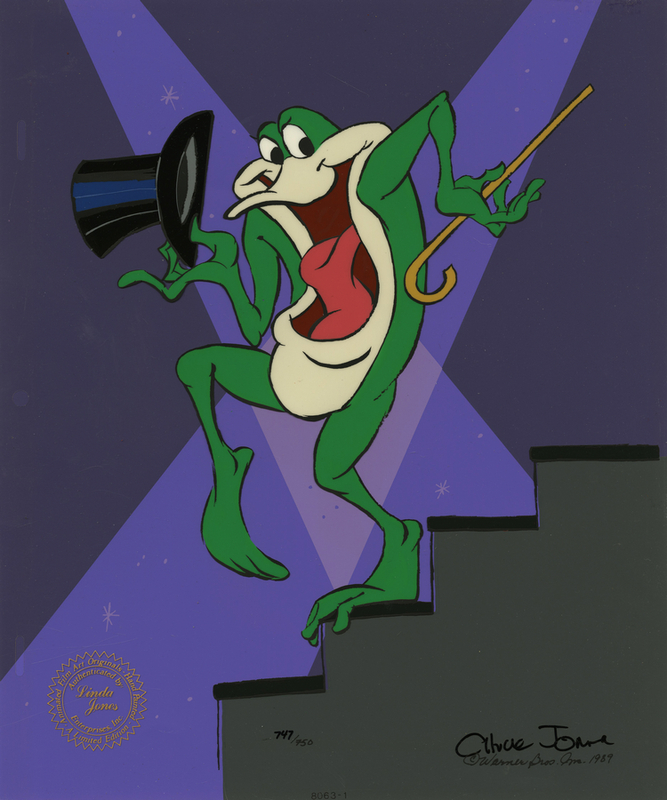 This hand-painted limited edition features the beloved froggy character in a standard pose of Michigan singing and dancing his way down some stairs, and was created by the studio's art program. This limited edition was released in 1989 in a strict edition of only 750 pieces, and sold-out long ago. Michigan only appeared in a couple of the original classic WB shorts, and production art of him is nearly impossible to find, so the studio created this limited to allow collectors to add a beautiful piece of the character to their collection. This particular piece is hand-numbered 747/750 and is hand-signed by the legendary animator, Chuck Jones. The overall measurements of the piece are 12.5" x 10.5" and the image itself measures 10" x 9". The cel is in excellent condition and is paired with its original printed background as it was released by the studio, and is accompanied by its original studio COA.